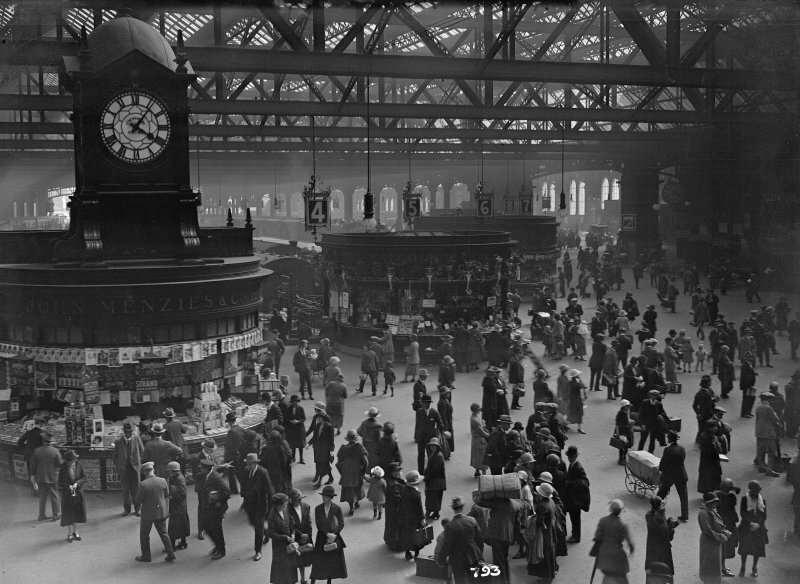 Description View of concourse at Central Station, Glasgow. Scope and Content Interior of Central Station, Glasgow The Central Station was built for the Caledonian Railway Company by the Edinburgh engineers, Blyth and Cunningham and opened in 1879. The Glasgow and South Western Railway had refused to let the Caledonian use St Enoch Station. Between 1899-1906 the station was extended to 13 platforms. This is the passenger concourse as laid out by D Matheson, design engineer. It had a large timber indicator board and matching ticket offices, waiting rooms and restaurant. Part of the steel work was erected by the Motherwell Bridge and Engineering Company. Source: RCAHMS contribution to SCRAN. >> Item Level (SC 367263) View of concourse at Central Station, Glasgow.